After the knees, the shoulder is the most commonly injured joint in rugby. 20% of rugby injuries are to the shoulder, and 35% of those injuries are recurrent. Players who hurt one shoulder are also more likely to damage the other shoulder at some point. A lot of ruggers have banged-up shoulders! Shoulder injuries in a sport like Rugby are hardly surprising. The shoulder is a very mobile joint, capable of a wide range of movements. However, it’s also inherently unstable and therein lies the problem. It’s relatively easy to overextend, twist, dislocate, or otherwise disrupt the shoulder joint, damaging the underlying structures in the process. Try scoring injuries – hyperflexion of the outstretched arm when reaching to score, often resulting in the rotator cuff and anterior capsule tears. Lifting and then losing a player overhead can lead to similar hyperflexion injuries. Direct impact injuries – the result of hitting another player or the ground with your shoulder, often resulting in SLAP (superior labrum anterior-posterior) and posterior labral tears. Tackler injuries – characterized by extension of the raised arm behind the player while tackling. Can result in partial or full dislocations or SLAP tears. 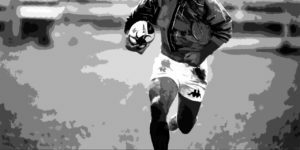 Wear and tear – training for and playing rugby involves a lot of repetitive shoulder movements that can add up over time to cause chronic shoulder pain. There may also be a build-up of calcified deposits in and around the joint, especially in the area of the AC joint. Statistically, rugby shoulder injuries are most likely to happen at the very beginning and the end of a match. Injuries at the start of a match are often caused by opening whistle nerves and trying to make a big physical impression on the opposition. Injuries toward the end of a match are likely to be the result of fatigue. Keeping your shoulders strong and healthy can help prevent a lot of shoulder injuries, which is why we published our article Shoulders and rugby – what do I need to know. In this article, you’ll learn how to look after your shoulders to minimize your risk of injury. Besides, we have produced a free joint-by-joint prehab guide for ruggers which covers special exercises for preventing shoulder injuries. Another way to deal with shoulder injuries is to tape up your shoulder before playing. The tape provides extra support and reduces shoulder joint stress by increasing stability and restricting specific movements. Because of these benefits, a large percentage of ruggers tape their shoulders before playing. You probably won’t be able to tape your own shoulders. However, it’s always a good idea to have a good supply of the right kind of tape so you can get someone else to do it for you. As the aim of taping is to eliminate excessive movement, the tape used should be adhesive, non-stretch tape, between 35-40 mm wide. It’s not a good idea to attach adhesive tape directly to the skin, so you’ll also need a hypoallergenic underlay too. Avoid taping your shoulders, or any joint, too tightly as you may impede blood flow which can cause serious medical problems. The inelasticity of the tape, when applied in the correct position, should ensure the tape is tight enough. There is no need to crank down on the tape to make it overly tight. Ruggers are a tough bunch, but adhesive tape can play havoc with even the most non-sensitive skin. Avoid unnecessary discomfort by shaving the area to be taped the day before the tape is going to be applied. Also, make sure the area is freshly washed and dried before the tape is used. The oils on your skin can stop the tape from sticking properly. Ideally, your team physiotherapist or doctor should be responsible for taping your shoulder, but this is often not possible because he or she is busy with your teammates. For that reason, it’s useful to know how to tape your own shoulders. It’s not practical to give you a single set of shoulder taping instructions to follow as there is a wide range of injuries and taping methods to choose from. In many instances, methods are combined, and players have a specific way they want their shoulders taped before playing. Instead, here are five taping videos to use as guides. Try different methods during training so you can find out what works best for you. Do not tape your shoulder in a new way on the day of a game as it could cause more problems than it helps. In this video, Queensland University rugby head trainer Cam Wray shows one way to tape a shoulder to prevent dislocations. This is a useful method for players who have had dislocations in the past or have excessive movement (hypermobility) in the shoulder joint. This video from Elastoplast with Physiotherapist Nicholas Ames shows how to tape a shoulder for increased stability but without compromising mobility. This is an excellent preventative taping method that is suitable for general shoulder care. This taping method is designed to increase the anterior and posterior shoulder and AC joint stability. Note the use of underlay and anchors to ensure the tape stays in place for the entire duration of the match. This is one of the simpler taping methods and one that most players should be able to learn to do. This video from sportsinjuryclinic.net shows Premiership Football Physiotherapist Neal Reynolds demonstrating how to tape to support and protect the AC joint. AC joint problems are pervasive in rugby, so this method is very widely used. This video shows sports physiotherapist Cam Lillicrap demonstrating a robust method to assist in preventing re-injury following the shoulder injury or reconstruction. This is an early stage taping method best suited to players who are just returning from injury. Taping your shoulders before rugby can help prevent injuries or stop existing injuries from getting worse. Because shoulders injuries are so prevalent in rugby, the chances are high that you’ll need to tape your shoulders at least a few times during your playing career. Take time learning and practicing shoulder taping as it’s a useful skill not only for yourself but for helping your teammates too.